Everyone is welcome to participate in any of our programs. There is a $5 registration fee for non-members. SARC members get free access to all our programs...so just join! Memberships begin at $5. Click here to join SARC. We will add webinars as they are scheduled. If you have a topic you would like to see on our webinars, please let us know at texasangorarabbitclub@gmail.com. Join us for a Giant Angora discussion with Janet Gruber. Two time ARBA BIS winner, Linda Cassella, shares her Convention preparation tips with SARC members via Google+ Hangouts. Our club was pleased to have the opportunity to hang out with ARBA executive director, Eric Stewart. Eric has French Angoras and loves fiber as much as we do! SARC is excited to have Angora rabbit legend, Betty Chu join us for a Q&A session webinar! SARC members are welcome to join us by registering using the form to the right. Webinars are free for all SARC members in good standing. Non-members may also register for $5. Current SARC members, please fill out the form to the right to request this video. The SARC is thrilled to have 2012 ARBA National Convention's BIS winner, Linda Cassella, share her knowledge in this informative webinar. She discussed developing a breeding program and answers questions from SARC members on everything from breeding ethics to nutrition. This webinar was held December 1, 2012. This webinar was recorded and is available to SARC members. Just email us at texasangorarabbitclub@gmail.com if you are a member and wish to view. Fiber artist, Dana Faber, presented this interactive webinar where she taught participants how to dye fiber with KoolAid! Supply list comes as a separate email attachment with the webinar. This fun, interactive class introduces you to the world of dyeing! Dyeing With Dana webinar was last held October 6, 2012. This webinar was recorded and is available to all SARC members. Just email us at texasangorarabbitclub@gmail.com if you are a member and wish to view. Curious about Angora rabbits, but have no idea where to start? Enroll in Angora 101 and learn all the basic aspects of Angora care including feeding, housing, grooming, and health. We even cover getting an Angora rabbit. Whether your interest is show rabbits, fiber or companion animals...there's something for you. The Angora 10 webinar is geared to contain approximately an hour of instruction plus valuable Q&A sessions with experienced Angora exhibitors and breeders. 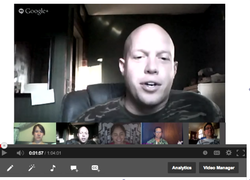 Angora 101 webinar was last held July 14, 2012. 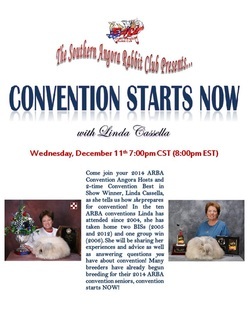 Our next Angora 101 webinar has not been scheduled yet. Thanks for your patience.